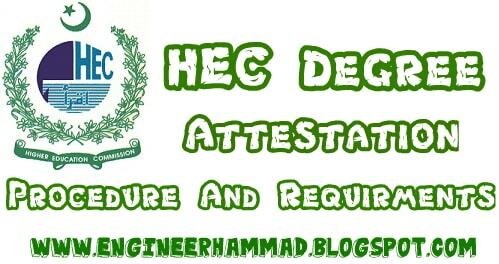 HEC degree verification and procedure for documents attestation is written in this post. You can check HEC office timing, attestation procedure and verification method and much more. HEC stands for Higher education commission. HEC documents attestation including transcripts, degrees, bachelor level certificates and diplomas. HEC do not attest foreign degrees and Deeni asnaad. In the case of foreign certificates, an equivalence certificate is required HEC that will be determined by the equivalence cell of HEC. HEC Lahore office, HEC Karachi office, and HEC Peshawar office give token for attestation between 8:00 Am to 9:00 Am on Monday to Thursday (5 working days). HEC Islamabad office timing for degree attestation is from 8:00 Am to 11:00 Am where they only issue 240 tokens per day. Within 5 working days attested documents would be returned. Go to the HEC official website http://das.hec.gov.pk and "Sign up" for an account if you do not have before this otherwise "Sign In". Now fill the online form where you have to put this information: Your name, father name, date of birth, address, contact number and in education you have to submit your educational detail starting from matric to the last degree. After filling all required information now you are done. Go to HEC office and take a printout from HEC office. (Others are not acceptable). Be care full while printing: Just select the city regional office from where you are going to attest your document. Before going to HEC office to attest your degree, you have to know about the following guidelines to get rid of difficulties. Matriculation / Secondary School Certification. Intermediate / F.A / FSC / Higher School Certificate. Bachelor Degree with Result Card / Transcript / DMCs. Completion Letter / Verification Letter from the University. CNIC (For Local) / Passport Copy (For Foreigners). Attach HEC equivalence certificates in case of foreign degrees / Deeni Asnaad. Online HEC Application Form. You will print out this only from HEC computer lab. 1. Authority Letter attested by grade 17 officer in favor of you. 2. CNIC of that person. The applicant must have passed degree within 3 years from the date of commencement of the examination. HEC degree attestation fee detail is as written below. Degree / Transcript / DMCs fee is 800/- RS for one original document. Photo Copy fee is 500/- RS for one document. The fee would be submitted by hand at HEC office at fee counter window#1. H-9 Sector, East service road Islamabad. Liaqat national library premises behind TV station Karachi. House No. 53/7 Zargoon road opposite engineering building quetta.